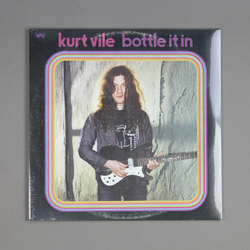 Kurt Vile - Bottle It In. Vinyl LP, CD. Bleep. For his seventh solo studio album Kurt Vile unleashes another perfect blend of rock n roll sensibilities, twanging guitars and mellisonant vocals. Following on from the success of ‘Pretty Pimpin’ and his recent collaboration with Courtney Barnett, Philadelphia's ex-War On Drugs vocalist hits the sonic nail on the head with ‘Bottle It In’, a dreamy LP that journeys from the punchy concerns of ‘Loading Zones’ and its cheers of collective dissidence to the banjo-oriented and gently harmonised chorus of ‘Come Again’.